Why it's the best time to immigrate to Australia from India? Why it’s the best time to immigrate to Australia from India? Australia is the right place for the individuals looking for growth and better opportunity in career and life. Particularly, in highly populated country like India where the competition is huge and opportunities are limited, people look to explore the overseas job opportunities. And Australia provides the right platform to the young and talented individuals looking for career growth and higher education in a developed nation. If you are an immigration aspirant, this is the perfect time for you to immigrate to Australia. Why it’s the right time to move to Australia? It’s the right time to move to Australia for various reasons. The demand for Australian visa or immigration is increasing every day and if you delay your decision of Australia immigration now, you might be competing with highly skilled and talented professionals in coming years for the Australian visa, with tougher immigration rules as well. Below are a few key reasons to move to Australia at now. Australia is facing skill gap issues across its various industries. Hence, it needs the qualified and skilled professionals from overseas countries, who could fill the skill gaps in the country and contribute the local economy and growth. India produces thousands of skilled professionals every year and hence, whoever needs the high-income jobs and better living standard in a foreign country, Australia is the right platform for him/her. The processing time of certain skilled and family visa categories at now ranges from 4 months to 1 year. Hence, it’s the ideal time to apply for an Australia visa, as you may find entry in Australia just within few months. Australia has a powerful economy and most of its industries are either fully developed or developing very fast. Hence, it creates multiple job opportunities in various domains and provides high income jobs to the individuals with right skills and experience. At now, Australia has numerous vacancies in the sectors, i.e. construction, healthcare, IT, Mining, Engineering, science, and technology, etc. Australia is a real magnet for international students especially the student from India. Australia provides work with study option to the international students and hence, the students from India love to get enrolled in the top Australian universities to explore the work pathways for them in future. They gain the enough experience through work with studies and later go on to settle in Australia. Australia invites the skilled workers through the straightforward point based immigration system, wherein the point is given to their each profile aspect, i.e. education, work experience, language proficiency, etc. This system denies any discrimination and provides the equal chance to everyone to get entry in Australia. 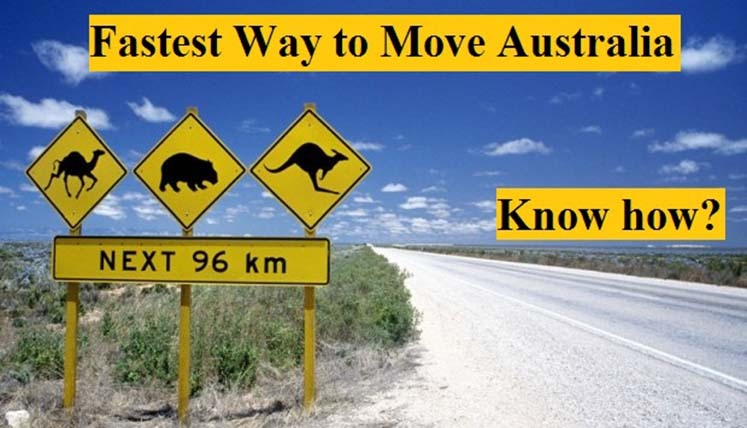 What is the fastest way to move to Australia? If you are a skilled worker, it’s always good to check your point score before starting the process for Australia immigration. You need to score minimum 60 points to qualify to apply for Australian visa through point based system. Once you have checked your score, you can choose an occupation from given SOL/CSOL list and apply online for the desired visa. To get the complete assistance and support from the registered immigration expert for Australia at Visas Avenue, you can call on contact nos. 011-48447777 (Delhi) or 080-46668222 (Bangalore). You may also send your queries with regards to immigration at email id- info@visasavenue.com. Visas Avenue is the leading Immigration Advisory Company in India.